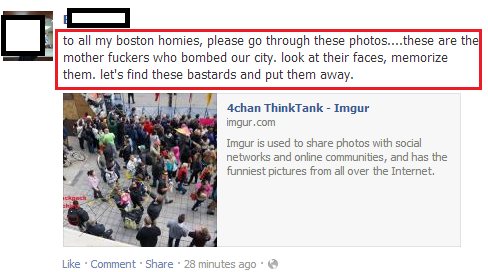 Reddit's initial hunt to find the Boston bombers devolved rapidly into a sort of "racist Where's Wally", profiling – racially and otherwise – scores of innocent people. Update, 20 April: The two suspects for the bombing have been identified as Tamerlan and Dzhokhar Tsarnaev. The former was killed in a gunfight with police in the early hours of 19 April, while the latter was arrested and is now in custody. Sunil Tripathi was found dead on 24 April. Holy crap. One of the suspects being named on the scanner, is one of the names Reddit came up with early this morning. Wow Reddit was right about the missing Brown student per the police scanner. Suspect identified as Sunil Tripathi. So this kinda changes up the smug opining about a Reddit "witch hunt," hm? IF it is the Brown student in custody and IF he was one of the Marathon Bombers, Reddit had it YESTERDAY and the whole world has changed. On 16 March, Sunil Tripathi, a student at Brown University in Providence, Rhode Island, went missing, leaving behind a cryptic note. His whereabouts are still unknown, but for a brief moment, it looked like he was involved in far bigger things. His name turned up on the Boston Police Department's scanner early this morning, suddenly and without warning. We now know that BPD was mistaken: according to NBC and the Associated Press, the suspects are migrants from an area of Russia near Chechnya. But that didn't stop a lot of people getting very excited. The BPD was chasing two men who had held up a 7/11, shot and killed a police officer, and then headed west, apparently hurling explosives out of the window of the stolen SUV they were driving. As the chase continued, it seemed more and more likely that the men must be related to the Boston Marathon bombing, and at 7:20am BST the Boston Globe confirmed it: one suspect had been taken into custody. That man, they now report, is dead. The second remains at large. But it's not quite true to say that Sunil Tripathi's name first came up in this startlingly new context on the BPD scanner. Because Reddit "called it" first. Late last night, Redditor pizzatime linked to reports of Tripathi's disappearance, asking "Is missing student Sunil Tripathi Marathon Bomber #2?". At that time, the FBI had just released photos of two suspects, neither of whom had appeared on any of Reddit's crowdsourced hunts for the bomber. But pizzatime noticed that one of them bore a resemblance to Tripathi, and posted accordingly. The worst thing is that through sheer force of weight whoever the bomber was will probably have been highlighted by someone on Reddit. So we’ll be subjected to endless “how Reddit found the bomber before the police” headlines when all they did was libel hundreds of people. Reddit had set themselves the task of finding a needle in a haystack, but failed to take account of the fact that they had no way to tell for certain whether they'd found a needle or a needle-like piece of hay. The initial hunt to find the bombers devolved rapidly into a sort of "racist Where's Wally", profiling – racially and otherwise – scores of innocent people. It's hard to be certain of the provenance, but that crowdsourcing (along with 4Chan's who did much the same thing) certainly led to images stripped of their context being passed around as though they were confirmed, and probably had a hand in the New York Post smearing two innocent men on their front page. And now it looks like it smeared Tripathi, too. But really, the crowdsourced hunt for the bomber should be split into two acts. The first, finding suspicious-looking people in photos of the marathon, was always going to end in innocents' reputations being destroyed. With no method of confirmation, few feet on the ground and a wealth of opportunity for false positives, Reddit was abysmally suited for the task, and it failed abjectly. But once the photos of the suspects were released, it had more chance of being useful. "Do you know this man?" is the archetypal example crowdsourcing. Wanted posters have been used for over 130 years, and we've got a pretty good hang on how they work by now: you need to find someone, so you show their face to as many people as possible. Tripathi looked like the second bomber, and so his name was linked. But then Reddit took it further. The crowdsourcing part of wanted posters is about making sure as many people as possible see the picture. It is emphatically not about making sure any allegations resulting from the picture are made public. That's not crowdsourcing, it's just speculating; there is little advantage in getting the crowd involved at that point, and the major downside that someone's life might be ruined based on who they look like. Tripathi wasn't the bomber. He just looked like him. How his name ended up with the Boston Police Department remains unclear, but it is clear that he is not a suspect. Where he is remains an open question, but maybe one Reddit should steer clear of. The world hasn't changed that much. The FBI's two suspect photos, now identified as the Tsarnaev brothers.